My go-to Disney park souvenir is a shirt. I love them because I can buy one, then wear it for the next day’s adventure. However, I also like to arrive with an appropriate shirt already in hand to start the trip off right. Since the Epcot International Flower and Garden Festival is currently going on at Disney World, my mind was on flowers when I was working on my project, and one of my favorite Disney scenes is the garden from Alice in Wonderland. Those blooms are so insulted at the idea of Alice being a wild flower in their midst! 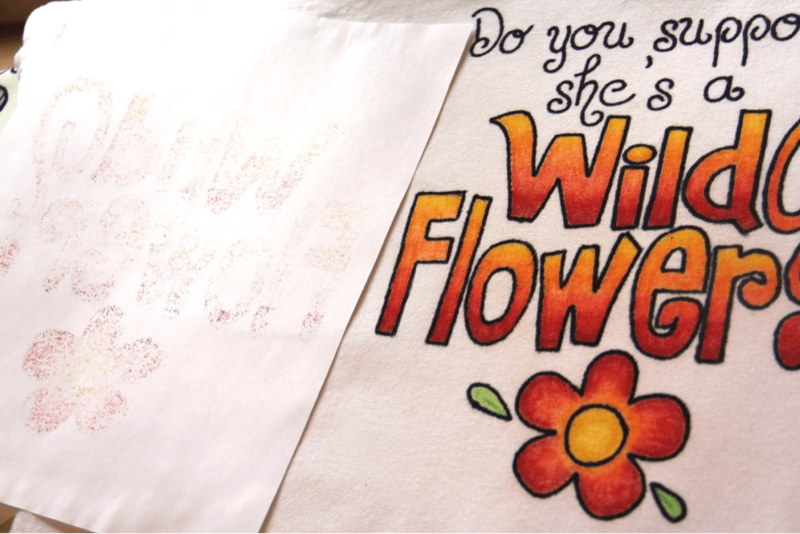 To make the Alice in Wonderland wildflower T-shirt, you'll need this pattern, a cotton T-shirt (the kind from a craft store work best), freezer paper, printer paper, a permanent black marker and crayons. Because it takes a light touch to color on the shirt, I'd recommend this for older kids. Wash and dry the T-shirt. Print the design on regular printer paper. Cut a piece of the freezer paper at least a couple of inches larger than the design on all sides. Using a dry iron, press the waxy side of the freezer paper to the inside of the shirt, under the area where you'll want the design. The paper will stabilize the shirt for coloring and prevents the marker and crayon from bleeding through to the back. Tape the design to the back of the freezer paper so it faces the front. You'll need to be able to see through the shirt, so either hang it in a window by taping the hanger to the glass or lay it on a glass-top table with a light underneath. Trace over all the outlines with a marker, either fine or regular tip, depending on the look you prefer. I used a regular tip. Use a light touch so you don't pull the paper loose. When you're finished tracing, iron the paper on again to reattach any spots that pulled up. Lay the shirt down on a hard surface. Color the design in with crayons. Make sure the crayon is sharp for any corners or small areas.A feathery, single direction stroke is best to prevent pulling on the shirt. You can build up layers of color as needed. I made mine with an ombre look by slightly overlapping and layering five different colors. When you've filled in all the color, lay the shirt on an ironing board, color side up. 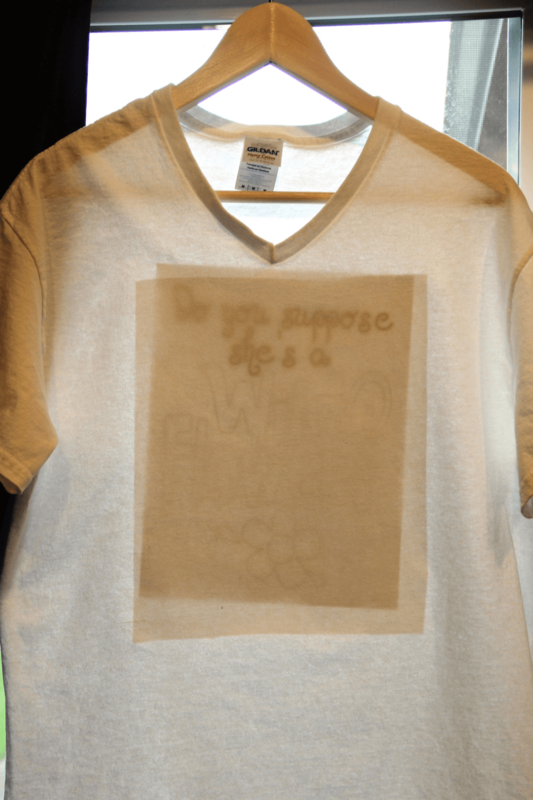 Place a piece of blank printer paper over the top of the design and iron with a dry iron. Make sure the paper doesn't shift. he paper will absorb some color. Repeat with a fresh piece of paper until no more color comes off. You can repeat the coloring and ironing process until you are happy with the color. Mine has two layers. You can also replace the freezer paper if it stops sticking to the shirt. Wash the shirt in cool water on a gentle cycle and line dry to keep the color vivid longer. If it fades you can repeat the coloring process. 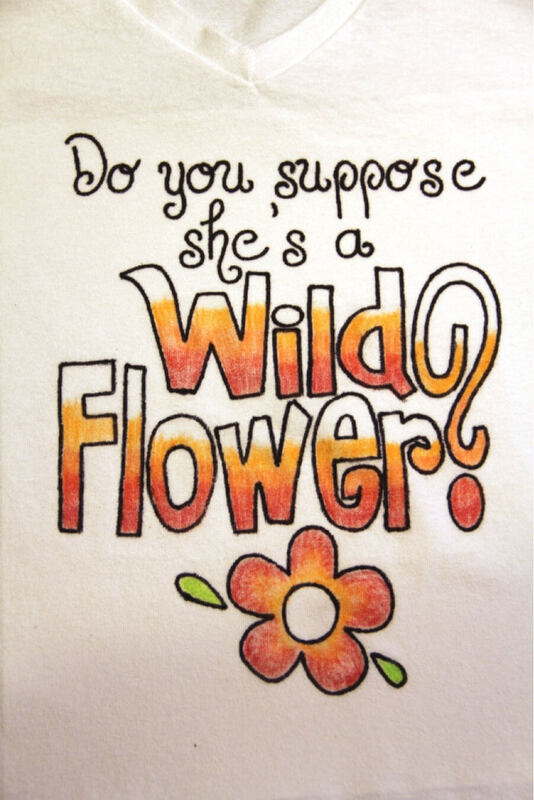 Wear it proud, all you wild flowers out there!